Icy Dock has changed the game yet again with the new EZConvert Pro MB982SP-1S Enterprise Full Metal 2.5” to 3.5” SATA SSD & HDD Converter. The MB982SP-1S is predicated off the incredibly popular MB882SP-1S-1B device, taking its general concept and improving it tenfold. This product is designed using the dimensions, connection locations, and mounting hole positions of a standard 3.5” SATA drive, so that it can be used in any internal hard drive bay, as well as with backplane and hot swap modules. The MB982SP-1S utilizes a full metal design, creating a better environment for cooling, as well as giving it a rock solid construction, ideal for industrial, enterprise, and military applications. 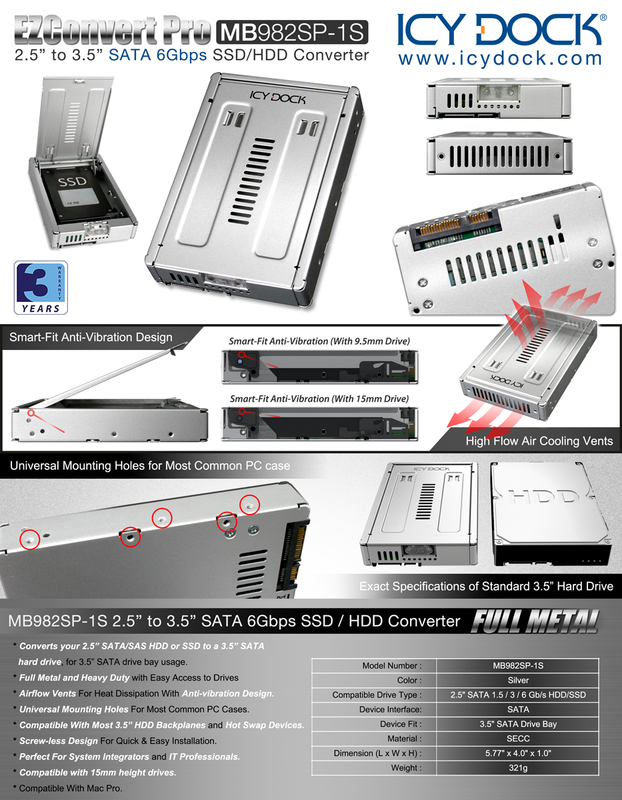 The MB982 can handle almost any type of 2.5” SATA drives, including the 2.5” SSD, Western Digital VelociRaptor 10K RPM drives and high-capacity 1TB hard drives. To allow for 12.5mm and 15mm drive heights, we have included our Smart-Fit Technology, which secures the drive in its place whether it is a thin 7mm or thick 15mm.